In 1998, when Amazon.com began to recruit employees, they gave temp agencies a simple directive: send us your freaks. Mike Daisey -- slacker, onetime aesthetics major -- fit the bill. His subsequent ascension, over the course of twenty-one dog years, from lowly temp to customer service representative to business development hustler is the stuff of both dreams and nightmares. 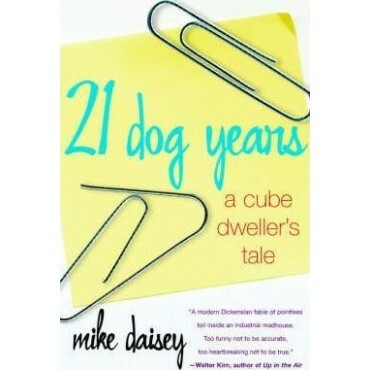 Here, with lunatic precision, Daisey describes lightless cube farms in which book orders were scrawled on Post-its while technicians struggled to bring computers back online, as well as fourteen-hour days fueled by caffeine, fanaticism, and illicit day-trading from office desks made out of doors. You'll meet Warren, the cowboy of customer service, capable of verbally hog-tying even the most abusive customer; Amazon employee #5, a computer gamer who spends at least six hours a day locked in his office killing goblins but is worth a cool $300 million; and Jean-Michele, Daisey's girlfriend and sparring partner, who tries to keep him grounded, even as dot-com mania seduces them both. 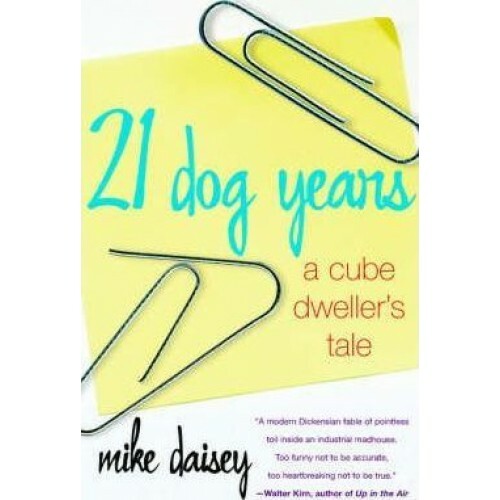 Punctuated by Daisey's hysterically honest fictional missives to CEO Jeff Bezos, 21 Dog Years is an epic story of greed, self-deception, and heartbreak -- a wickedly funny anthem to an era of bounteous stock options and boundless insanity.